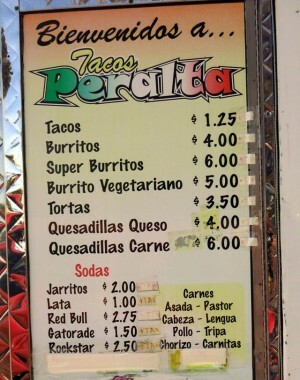 Cheap, delicious, quick Mexican food to go. Nasty decor 🙂 but the beef burritos for $4 are outstanding! Open 7 days/week from 10am-6pm Mon-Sat and 9:30am-6pm Sunday (summer hours). Close to Foster City but getting there might be a little tricky the first time. From Hillsdale Blvd headed west across Hwy 101 take the first left hand turn on Saratoga Dr and then another immediate left on what is also called Hillsdale Blvd. Look for the BevMo … the food truck will be parked along the street across from BevMo Liquors. See map below for exact location.